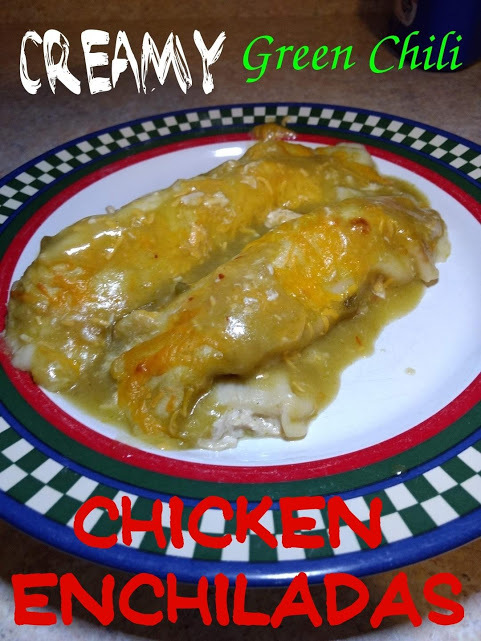 Mexican food is my weakness and these super easy Green Chili Chicken Enchiladas don’t disappoint! I’ve been wanting to make enchiladas for a while now, but the thought of having to hand roll each one put me off. After thinking of new ways to use my Slow Cooker Shredded Chicken, I finally decided to give it a try! Turns out, I had nothing to fear. Rolling all the tortillas was way easier than I thought, especially since I only used 9. I could have stretched the chicken to make the tenth one, but I wanted mine stuffed full of chicken and cheese. I laid out three tortillas at a time to fill, which made it quicker. Also, I already put enchilada sauce in the bottom of the dish so I could put the rolled tortillas directly into the dish. The prep work is easy and then all you have to do is bake! I tried to make a lot more than the two of us could eat so that we could have leftovers. We barely had any leftovers! And I swear they were even better the next day. Make Easy Slow Cooker Shredded Chicken according to instructions, adding half a block of cream cheese, ¼ cup chicken broth, and seasonings to slow cooker before cooking. Shred chicken. Split shredded chicken filling between tortillas. Add shredded cheese and roll up tortillas. 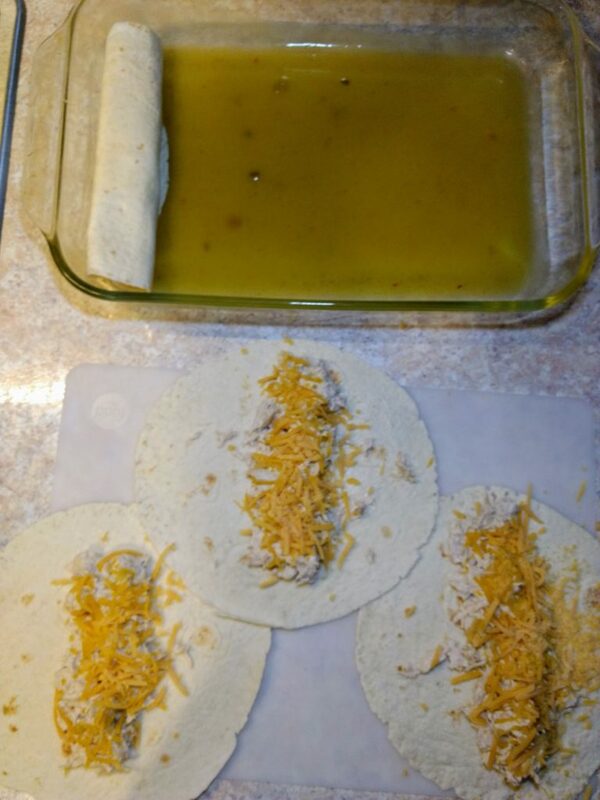 Spread some green chili enchilada sauce on bottom of an oven safe dish. Place all rolled tortillas, seam side down, into dish. 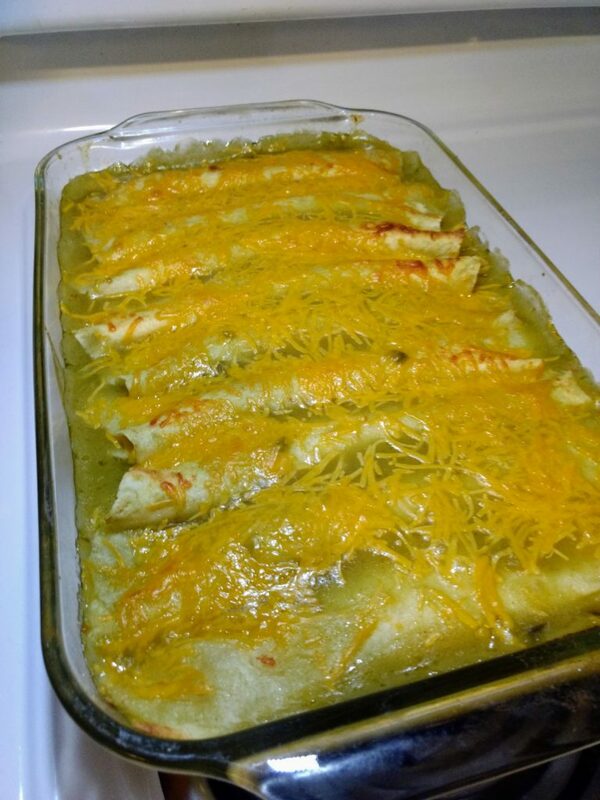 Cover with can of green chili enchilada sauce and top with shredded cheese. Cover with foil and bake in oven at 350 degrees for 25 minutes. Take foil off and bake for 15 additional minutes. You can use a packet of pre-mixed seasonings instead of the cumin, crushed red pepper, garlic salt, and minced onions. If you’re not a cream cheese fan, try sour cream! If you don’t like either, you can try to leave it out, but let me know how it turns out! I had leftover sauce which I added when reheating the enchiladas the next day. This recipe for green chili chicken enchiladas is a keeper, and we’ll definitely be having them again soon. Do you make enchiladas at home? What do you add to yours?